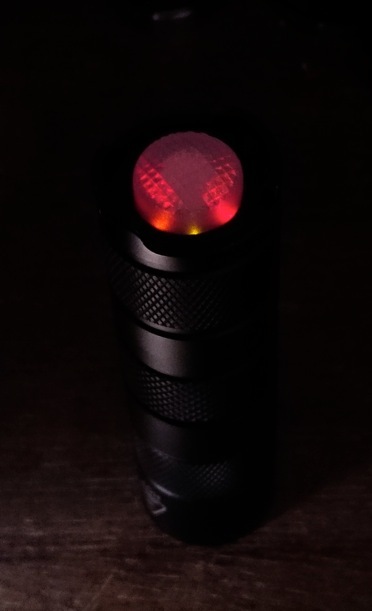 I prepped a Maglite 2D for an H22A heatsink, mtg2, and a 5A MTNMAX driver. Changed the stock switch over to negative (thanks OL!). Glued the led on and glued the copper positive contact. Phew that was a lot of work. Just have to pot and install the driver, solder some wires, and mess with that gigantic spring. I suppose I’ll need some killer 26650.. Maybe 32650’s to power this beast. Made grip ring and installed clip on Convoy M2. Tricked out Red Green style. This thread is really working, I see many mods passing by. The images in your G10 post are broken for me. What browser are you using? I just checked after I read your post, and it looks like the images are gone if I use Firefox, but ok if I use Chrome. Looking at View Source, the links to the images are still there in both cases (Firefox and Chrome), so I don’t know why the images are not showing in Firefox. EDIT: And in IE, the images are broken icons (which is ironic, since I host the images at onedrive). Oh man, I sure hope this counts as a mod. It would mean our first real mod. On the video there you can see first it turns red. And well we have ths ugly ultrafire with a red bezel. Who would put a red bezel there? I would have never bought it, a AE seller thought he could send it instead of the one I ordered that he has run out of. When the head was red I took it out and continued with the rest. And when it looked like it would fit nicely with the red head, turned off the fire. It now looks much better imho and it was a very nice experiment. The head actually looks little more red then on the pic. Does anybody now what causes this color change? The Miller, that is great. Now I gotta go cook a flashlight. Any idea of the temp the change takes. Wondering if it could be done in OVEN? I hope somebody knows a little more about this process, I find not a lot googling on the phone now. I’m thinking of doing the top portion only of my new TR-J20, it needs some character. What do you guys think about just doing the top part that is flat and says Trustfire, it unscrews from the finned area. Whoa! Or maybe just do the finned area and leave the top and battery section black…. Can you try viewing that post again in Firefox and in IE. It should work now with Chrome, Firefox, and IE. I think that the latter two didn’t like the image links being SSL. It’s post #144 in the thread (http://budgetlightforum.com/comment/901580#comment-901580). I’m on chrome and the images are fine. Safari too for that matter. 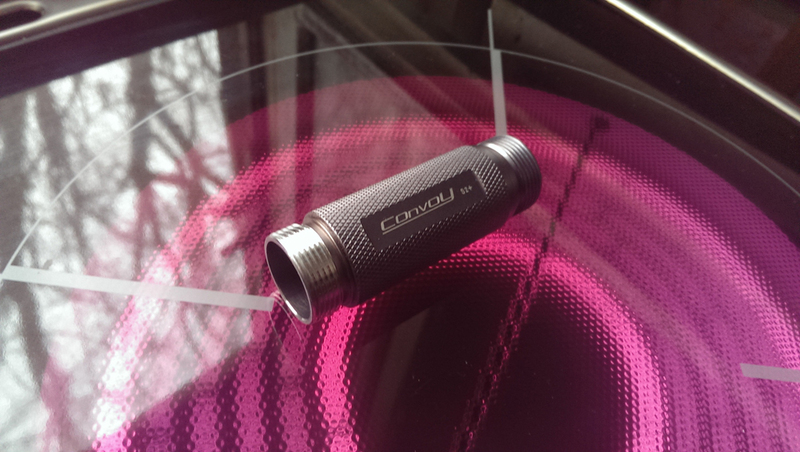 You can only bake the cheap anodized lights. 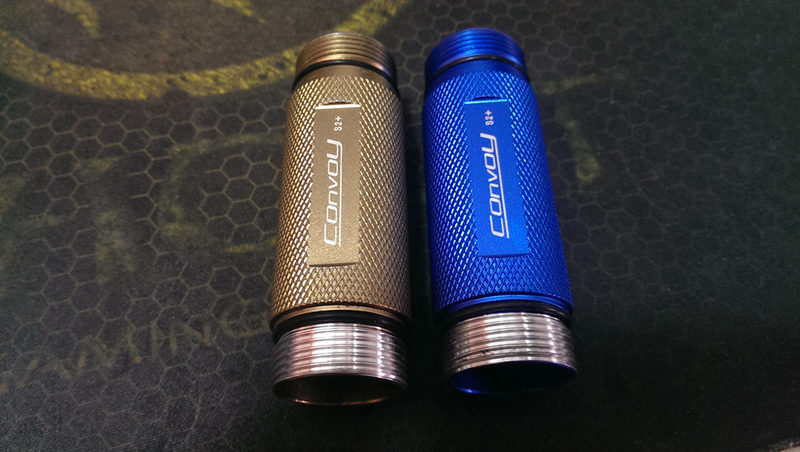 HAIII anodizing will not change colour. Mt TF JR-J20 is cheap ano isn’t it? Sorry PD, a little OT. I found this statement also in an old thread on the other forum. I can’t find real info why this color changing is happening. You know HA3 won’t work, but why? Thanks. I think/hope they should be ok for all browsers now. I think that the SSL links is what might have messed it up. True HAIII anodizing shouldn’t turn colour when baked. I don’t think there is any true HAIII that isn’t black. Time to question the specs. I’ve blasted real black HAIII with a blow torch with no change at all. Well too bad, luckely we got the cheap ones! YAY! Flashlight burning on a stove is very nice to do. 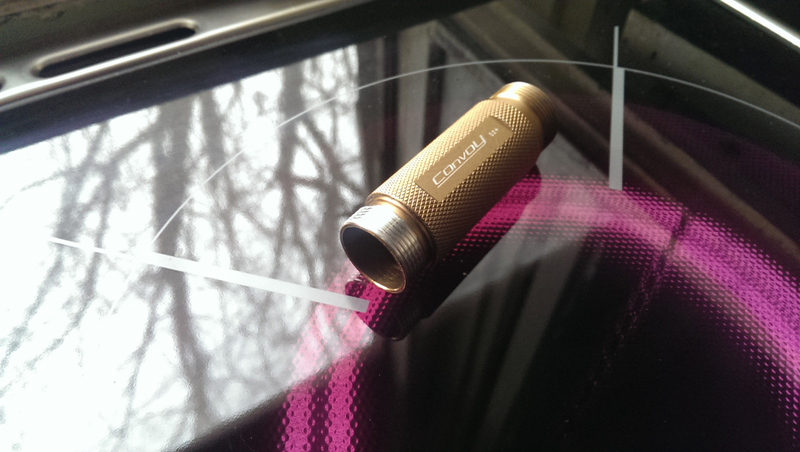 We did it again with the Ultrafire C8. Tricky, 4 parts that all behave different because size and shape. The color of the different parts is not a 100% match, we stopped a little too early, so the really brass that the tube of yesterdays had was not reached, however, this looks a lot like copper now. Specs from front to rear: clear o-ring instead of green stock one, stock glass lens, Carclo narrow optic, 3xSSL80 4500K 96CRI, triple Noctigon, 20mm diameter x 8.7mm aluminium spacer, flattened brass pill, BLF-A6 driver with 680Ohm bleeder over C1, silicon wire bypassed driver spring, flatted copperwire made into a ring as extra spacer between pill and battery tube because the battery tube is just a bit too short for a 18350 battery, intl-outdoor Be-Cu short spring on tailboard, PD68 switchboard with white small Omten, PD68 dumb six-led lighted washer with 3× 22KOhm resistors and yellow/orange/red leds, translucent silicon tailcover. I think it has become one of my cleanest mods, every problem was solved with a quality solution. The turbo output at start was 860 djozz-lumen, 725 after 30 seconds. Moon is 0.2 lumen. Some efficiency numbers. At turbo the efficiency is a mere 26 lumen/W. 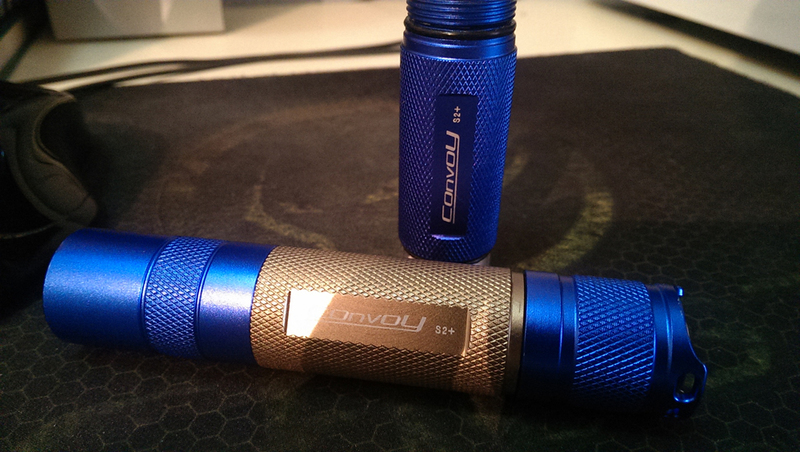 Even budget cheapies (from the time when they were still using Cree’s btw) did 40 lm/W. It is no wonder, the leds at 2,7A are already on the flat bit at max of the output curve, SSL80 leds have small 1×1mm dies, and you can not make 96CRI for free. 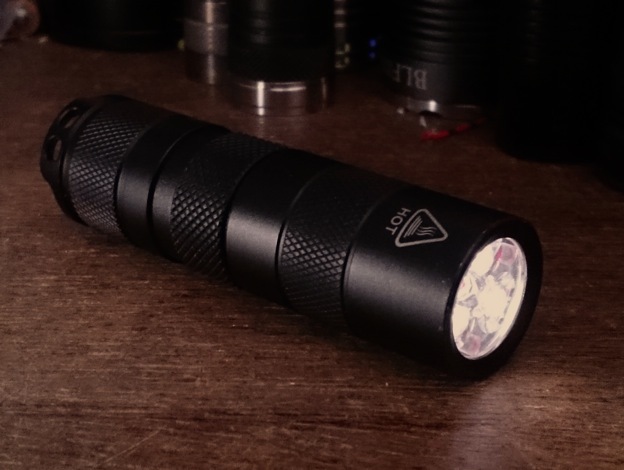 At low currents it is much better: level3 is 32 lumen with 56 lm/W, level 4 is 101 lumen with 50 kumen/W. The tint/colour reproduction is outstanding, less rosy as the Nichia 219A 4500K 92CRI with which I just compared it, but more plain white, I like it even better. And the tail-illumination is wonderful, a bit less bright than last mod which is much better at night, more an indicator than a bright beacon. The moon mode draws combined 9.6mA because of the bleeder resistor, this limits the moon setting to about 3 days. When off, the tail leds on a fresh battery draw 0.3 mA, assuming that the current lowers a bit when the voltage gets lower, it will drain the battery in about 4 months. looks like you built a campfire under the tail, nice! Now if TK could get those to flicker…. Bobbymk, that is the best color, we should have kept the C8 on the flames a little longer. You know this YouTube channel Simple cooking? My wife asked to do hers as well. And an yellow golden tube we just left on to see where it would stop, a shiny grey. I’ve baked a couple of my lights but don’t really prefer the change. I have used it to separate lights when I have more than one host of the same style, and selectively bake a bezel to make one stand out from the other. Well I like it, lots of fun. The SRK turned out shiny silver with an extremely light golden tint in the head, very beautifull but very hard to make a pic from. We have tow mere identical zoomies, 1 is my wifes EDC, she loves it and will not part with it, even though it is not a high quality. So we baked the second one, t turned out very bright light color, like platinum. And in the process of doing all the rest my wife liked the new olors and asked us to do hers as well. We cut off the heat a little sooner to keep it a tad goldenly like. right the EDC of my wife, she is very content with it. The images are still not working for me. I tried Chrome and IE. Great mod djozz. I don’t know why you were worried about getting a weird beam from the Carlco optic. 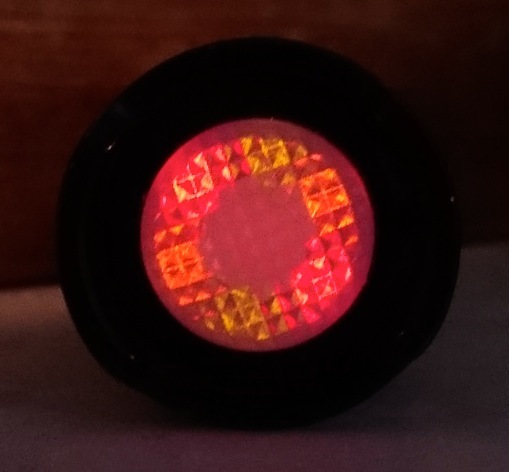 96 CRI with negligible yellow or rosy tint is getting closer to real sunlight all the time. The illuminated tail cap modding is still over my head. I need a dedicated “how to” instruction thread with with clear detailed pictures. I started reading the thread, but the pictures were blurry and I wasn’t sure what I was looking at. Then the discussion favours electronically minded people who already understand what going on. I’m a “see spot run” guy when it comes to the technical parts. I need simple instructions with clear easy to follow pictures. I catch on fast, but a concise uncluttered primer deploying the KISS methodology is needed for my aging brain to understand. Ouchyfoot, I have been thinking about doing a build thread on the dumb tailcap boards, with pics or videos. Still waiting on parts… May give it a go soon.